The final day finished with a great discussion but before that we started with a presentation from Hannah Breslin covering all the activities of SEE Student Enterprise and Employability. This part of the University of the Arts London is very proactive in exploring innovative support for students and Hannah explained a wide range of funding and advice options. Next was a group tutorial exercise which built on the experiment tried last year. This lead to some in-depth conversations with students sharing and challenging each other. The final event of the day was a real highlight as Dave White, Head of Technology Enhanced Learning at the University of the Arts London, led a fascinating and challenging discussion. Dave has developed a very useful way of seeing online engagement called ‘digital residents and digital visitors’. 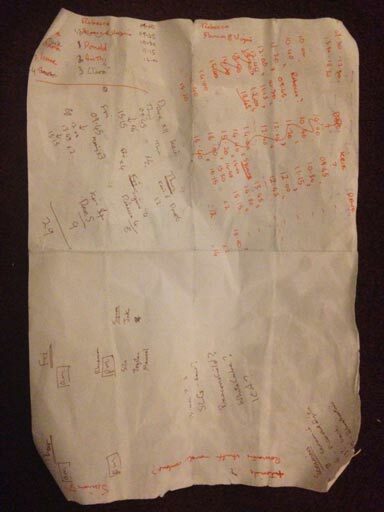 After a mapping exercise we then went on to discuss issues around ‘post digital’. Dave challenged the students to do the work of making visible the dominant ideology that is ‘hidden in the code’ of a digital environment, to find and reveal the cracks, the glitches, to critically dig up the fast disappearing space. In many ways this ‘digital revolution’ is no different to the many previous technology driven changes, but maybe this is faster than ever before. Dave suggested that much of what is happening culturally is hidden under the surface anyway but maybe now it is even more hidden due to the speed of change, leading to the dominant ideologies getting buried in the code and almost disappearing. An artistic critique of this environment is both a valid and important job to be done. saw a continuation of the letterpress workshop with students asked to bring in anything with a texture. These were used as source material for more experiments. The morning and afternoon saw more 1–to–1 tutorials. Organising 30 tutorials – delivered by 4 different tutors, across 2 days, fitted around the letterpress workshops, mostly in London but with some online for those unable to attend in person – proved to be a planning challenge (admittedly not much of a challenge for a skilled administrator but certainly one for an artist, as in the course leader!) This picture reveals a little of the process! Whether this is true or not day 3 and 4 gave the opportunity to work in the letterpress room at Camberwell College of Arts, something none of the students had done before. James Edgar runs the letterpress workshop but instead of a structured typography workshop everyone was encouraged to play and explore textures. Alongside the letterpress workshop everyone also had a 1 to 1 tutorial mostly with someone they had never met before, challenging but useful. 1 to 1 tutorials with visiting artists can be a scary experience. You have a short time to present some of your ideas and then engage is a deep discussion about your work. Today the students had tutorials with people they did not know and who knew nothing of their work. This creates a challenging but fascinating experience. The fresh perspective on your work can open up rich veins of investigation. In the afternoon there was the latest in the current MA lecture series at Camberwell, this talk given by Helen Douglas who has been making artists’ books since the 1970s, check out weproductions for more details, images and a their digital productions including a book called The Pond and Deuchar. 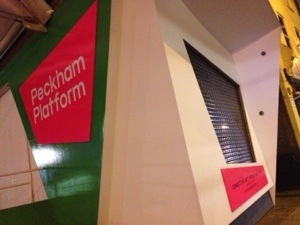 Finally a visit to Peckham Platform a small gallery with a big impact. Situated in the centre of Peckham (very close to Camberwell College of Arts) this gallery is all about connecting art, people and place. It’s engagement with socially engaged art practice has seen it work with many different groups within the local community and under the leadership of Emily Druff it is a beacon of what is possible when you attempt to make these connections. An example, today the gallery staff acted as expected in being friendly, helpful and willing to have a dialogue about the work and the gallery’s vision. Thank you.